Our QuickTrex® opticalCON MTP® fiber optic assembly harnesses the power of the Neutrik® brand tactical connector with tactical grade fiber to provide a superior rugged product. QuickTreX Tactical & Rugged Pre-Terminated Fiber Optic Assemblies are designed to withstand the harshest of environments. This assembly is a rugged and lightweight 12-channel mobile field cable which is military approved, and is ideal for audio and broadcast networks. 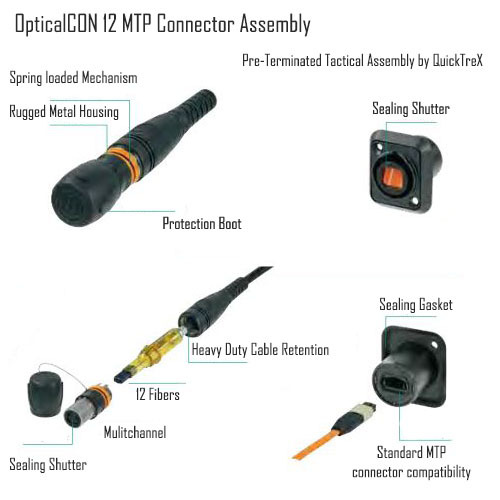 The opticalCON MTP® cable connector accommodates 12 optical fibers (multimode PC or single mode APC) based on conventional and proven MTP® connectivity, protected by a ruggedized and durable all-metal housing. A spring loaded push-pull locking mechanism provides excellent cable retention utilizing aramid yarn, and an automatically operated sealing cover protects the connectors from all contaminants like dirt and dust.